Here’s a look at a dozen stats that helped define the Green Bay loss to the Saints Sunday night. 1. The Packers had three turnovers. It was their sixth straight loss when they have three-plus turnovers in a game. Since 2000 the Packers are 6-24 (.200 winning percentage) when they have three or more turnovers in a game. 2. The 21-point loss was the Packers third 20-point loss on the road in their last four away losses. 3. The game was tied 16-16 at halftime. Green Bay is now 14-18 since 1966 when they are tied at half on the road. They are 2-5 since 2000 in such games. 4. 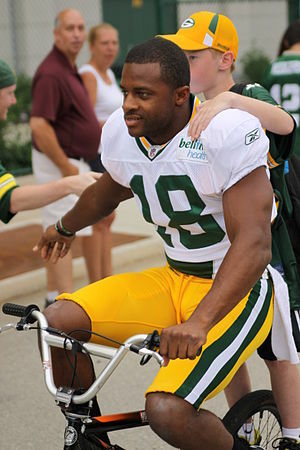 Randall Cobb had five catches for 126 yards, his eighth career 100-yard receiving game. The Pack are 6-2 when Cobb has a 100-yard receiving game. 5. Aaron Rodgers threw a pair of interceptions. Green Bay is 6-5 in the 11 games where Rodgers has had two or more interceptions. 6. New Orleans running back Mark Ingram became the 13th opposing runner to have 170 or more rushing yards in a game versus the Packers. It was the 19th time since 1966 that an opposing runner had 170 or more yards rushing in a game against the Pack. Green Bay is 4-15 (.211 winning percentage) in those games. Three running backs had multiple games with 170 or more rushing yards against the Packers: Adrian Peterson (4), Walter Payton (3) and Barry Sanders (2). 7. Green Bay was down by 14 points at the end of the third quarter (30-16). Since 2000, they have been behind by 14 or more points at the end of the third quarter in 25 games; they are 0-25 in those games. 8. 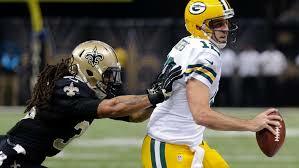 The Packers defense came into the game with New Orleans with the lowest opposing QB Rating at 74. Drew Brees’ QB Rating for the game Sunday night was 138.4. It was the 26th game since 1966 where an opposing QB had a Passer Rating of 130 or above against the Packers. Green Bay is 1-25 in those games. 9. Rodgers had 418 yards passing, his fifth 400-yard passing game with the Packers. The team is 3-2 in those games. Since 1966 the Packers are 5-3-1 in games where their QB has 400 or more yards passing. 10. It was the third time since 2010 that the Packers allowed 40 or more points in a regular-season game. Tampa Bay leads the league with nine games where they allowed 40-plus points since 2010. The Packers are one of only four teams to win a game when they allowed 40-plus points in a contest since 2010. They did it in a 45-41 win over Detroit on January 1, 2012. 11. Eddie Lacy had eight receptions for 123 yards. He was the first Packers running back to have over 100 yards receiving in a game since Dorsey Levens did it January 12, 1997 in a playoff games versus the Panthers. Levens had five catches for 117 yards in that game. 12. Since 2010, the Packers are 20-17 in games on the road (.541 winning percentage). In games within their division (versus Chicago, Detroit and Minnesota) they are 9-5 (.643 winning percentage) in games on the road since 2010, while they are 11-12 (.478 winning percentage) in road games outside the division in that timeframe. Here’s 11 interesting stats from the Packers 38-17 win over Carolina yesterday. 1. Aaron Rodgers completed 19 of 22 passes (an 86.4% completion rate) with 255 yards and three TD passes. It was the 27th time since 1966 that a QB had a completion rate above 85% with over 250 yards passing and three or more TD passes. For Rodgers it was his second time reaching these numbers in a game; he did it in the January 15, 2011 playoff game against the Atlanta Falcons. Rodgers became only the sixth QB to reach these numbers twice in a career (Tom Brady; Drew Brees; Peyton Manning, three times each; Craig Morton and Kurt Warner, twice). One other Packers QB reached these numbers… Lynn Dickey did it on September 4, 1983 in a game versus Houston. He completed 27 of 31 passes (an 87.1 completion rate) with 333 passing yards and five TD passes. 2. 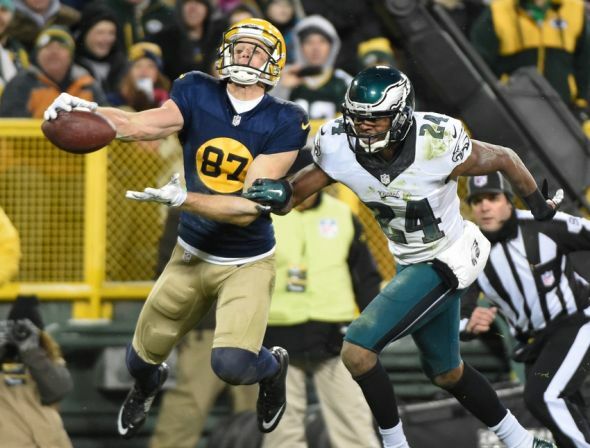 The Packers had one interception yesterday, their sixth straight game with a pick. Green Bay is 33-6 in games since the start of the 2011 season in games when their defense has at least one interception in a game. 3. For the fourth straight game the Packers scored 27 or more points. The last time they scored 27-plus in four straight games was in 2012 (weeks four through seven). The longest streak of games with 27 or more points for the Packers since the start of the Super Bowl era is seven. They did it in 2011 and 2007. 4. Jordy Nelson and Randall Cobb each had TD receptions in the contest. The Pack is 7-1 when those two each have at least one TD reception in a game. 5. Five different Packers scored a TD against the Panthers: Jordy Nelson, Eddie Lacy, James Starks, Randall Cobb and Davante Adams. The Pack had five different players score a TD in their win earlier this year over the Vikings (Adams, Cobb, Nelson, Lacy and Julius Peppers). The most Green Bay players to score a TD was six in their 55-7 win over Tennessee in 2012. In that game Cobb, Ryan Grant, DaJuan Haris, Greg Jennings, Aaron Rodgers and James Jones scored a TD. 6. 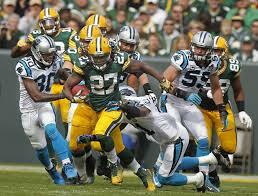 The Packers defense held Carolina starting QB Cam Newton to a 72.6 QB Rating. The Packers defense has the lowest opposing QB Rating in the league this year at 74.0. The Detroit Lions are second at 76.4. The Packers defense has allowed only one opposing starting QB this year to have a QB Rating over 85; that was Russell Wilson in Week 1 (110.9). 7. The Packers led 28-3 at half in yesterday’s game. They are now 38-0 in games since 1966 when they have a lead of 20 or more at halftime. 8. Green Bay has won four straight games. It is the sixth consecutive year that they have had a winning streak of four or more games in a season. 9. The Packers had two rushing TDs in the game. Since 2000, the Packers are now 39-10-1 in games where they score two or more TDs on a running play. 10. Green Bay scored 21 points in the first quarter. It was the eighth time in the Super Bowl era that they scored 20 or more points in the first quarter. They are 8-0 in those games. 11. The Packers are one of three teams to have three players with four or more TDs this season. Cobb has eight, Nelson has six, and Lacy has four. The other teams are Chicago and Dallas.